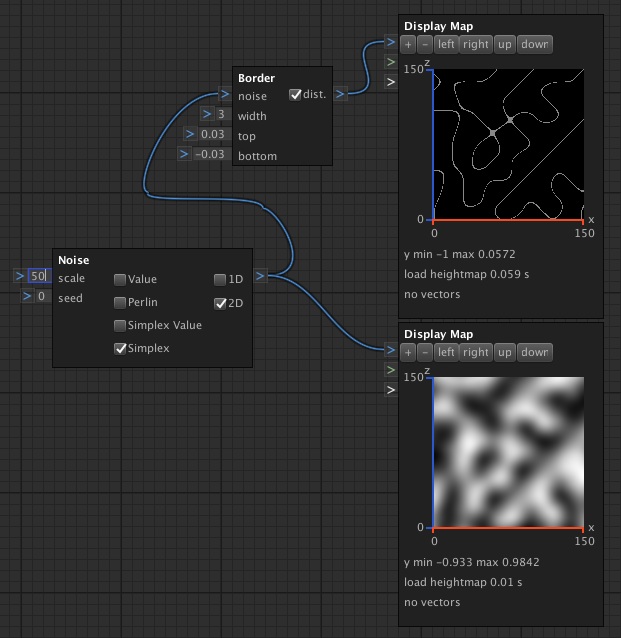 The BorderNode can be used to create borders based on noise values. For every requested value it checks the neighbours with a distance of width. If a neighbour value lies between top and bottom its distance or 1 will be returned. noise The noise value to create borders. width The width to check for neighbours. Notice: high values are leading to many neighbour checks. This can impact performance significantly. top The top value to take as a border source. Usually between -1 and 1. Higher than bottom. bottom The bottom value to take as a border source. Usually between -1 and 1. Lower than top. -1 values for non borders. Everything else is a border.